Tinky's Books < Tinky Cooks! As a child, I disliked rhubarb and balked at eating it. As an adult, I have evolved into an enthusiast for the tart red stalks that pop up in my New England yard every year. Like most converts, I am wildly enthusiastic about her rhubarb “religion.” In Love, Laughter, and Rhubarb I share some of my reasons for loving rhubarb: its taste, its place as one of the first crops of the agricultural year, and above all its versatility. This sweet/tart plant can be made into just about anything. It’s beautiful. It’s resilient. It’s versatile. Oh, my goodness. I just realized that I may love rhubarb because it’s like ME! 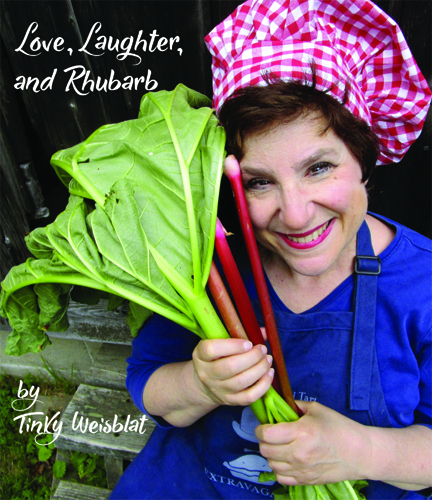 An absolute 'must' for all rhubarb enthusiasts, "Love, Laughter, and Rhubarb" is a sheer delight to browse through and immensely fun to plan menus with. Beautifully illustrated, thoroughly 'kitchen cook friendly' in organization and presentation, "Love, Laughter, and Rhubarb" is certain to be a unique, immediate, and enduringly popular addition to personal and community library cookbook collections. This full-color book makes a delightful gift. Please click below to order. Classic country cooking and colorful folk art fill the covers of The Pudding Hollow Cookbook, a tribute to a New England community that is small on population but big on flavor. The cookbook focuses on common rural pursuits—fairs and festivals, gardening and bake sales—as well as old-fashioned culinary traditions including puddings, pies, May baskets, rhubarb, jellies, vinegars, and maple syrup. Pudding Hollow is a real place, a dip between hills in the hamlet of Hawley, Massachusetts. It looks much as it does in the painting on the book's cover, much as it has for more than two centuries. A few homes, the Hawley town office (a former one-room school), and a cemetery mark its landscape. Pudding Hollow is also a place of the imagination and of the heart. To me and to my late friend and collaborator, artist Judith Russell, the area in which both have spent many years has long represented home in a sense that goes beyond the literal. The ties we and others feel here, both to the land and to each other, constantly renew valued American rural traditions. Pudding Hollow thus serves as a metaphor for the best in New England life and country life. The Pudding Hollow Cookbook is available for $29.95. First-class shipping is free within the United States, although residents of Massachusetts must pay sales tax. The total for Massachusetts orders is $31.82 per book. If you like, you may order the book online using PayPal. My world seemed to be getting smaller and smaller…. Like 5 million other Americans, my mother Jan (a.k.a. Taffy) had Alzheimer’s disease. And the stress of the disease was affecting both of us … as it affects patients and caregivers everywhere. Pulling Taffy follows Taffy and me through the final year of her life as we slowly learned how to beat stress. By reaching out to others, laughing every day, making music when we could, and finding joy in each moment, the two of us not only survived but flourished. We didn’t enjoy the disease—but we managed to enjoy life. Our story includes journal entries about caring for Taffy, history, meditations, and (of course!) family recipes. It is about dementia and death. More importantly, it is about love, joy, music, and laughter. Amazon also features a Kindle edition of the book. (if you have another e-reader, you may download a kindle app!). And you may download the audiobook via Audible. The book costs $17.95 ($19.07 for Massachusetts residents, including tax) with free standard shipping in the continental United States. I sang the old chestnut "In the Garden" at my mother's memorial service. To hear me sing it (a little too slowly, I'm afraid; it was more lively in person! ), click here. I am hard at work on a third work, a cookbook tentatively called Dishes to Die For. It will feature funeral foods from all fifty states—and a few favorites of my own! The recipes so far are deadly but delicious.